Soil contains a variety of particles, bacteria or even living creatures and can be viewed with a compound biological microscope or with a stereo dissecting microscope. When using a compound biological microscope to view soil you will want to place only a few particles of soil onto a microscope slide and put a cover slip on top to flatten out the sample. Start at the lowest magnification and work your way up from 40x, to 100x and then finally 400x. Can you identify any living organisms? If you have a camera, capture the image and note the differences between the lowest and highest magnification. If you don't have a camera just sketch what you see under the microscope. Were you able to find any living organisms or maybe a small worm? If you are using a stereo dissecting microscope, placing a bit more soil on the glass stage plate won't be a problem, and you do not need to cover it with anything since the stereo microscope has a greater working distance. The images of soil shown below were captured with the UX1 High School Compound Microscope using the DCM5 microscope camera with 5 megapixels. Notice some of the cracks in the dry dirt in the first image. And in the final image captured at 400x can you see some of the green moss? 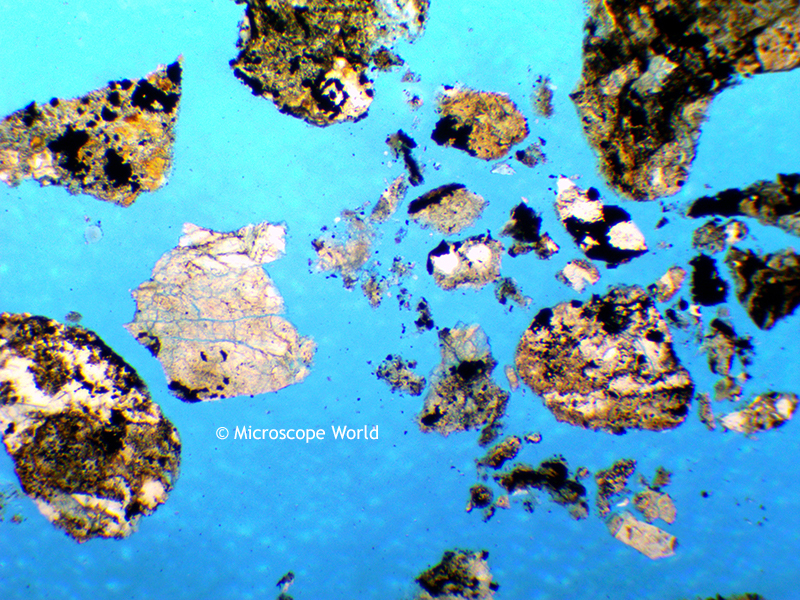 Soil captured under the UX1 High School Microscope with the DCM5 camera at 40x. 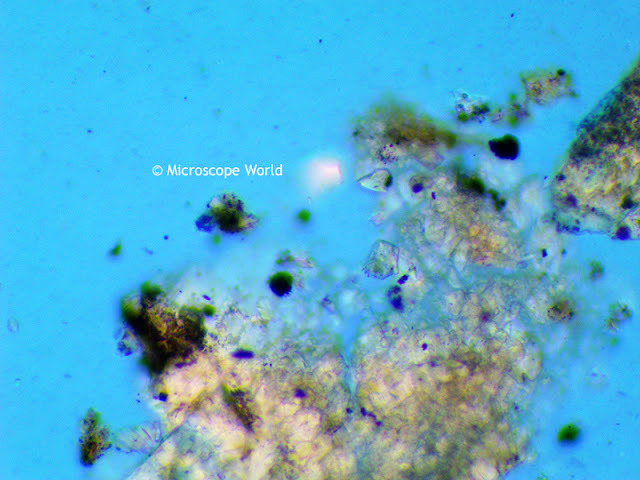 Soil captured under the UX1 High School Microscope with the DCM5 camera at 100x. 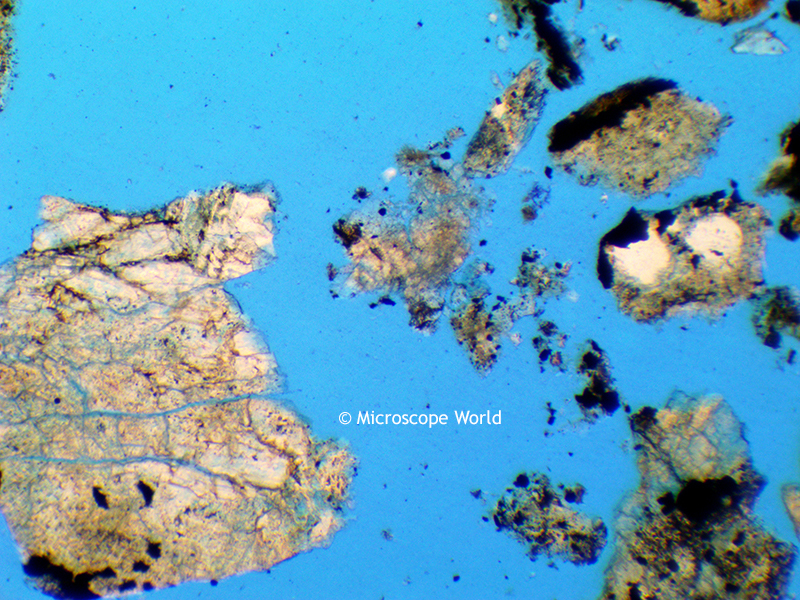 Soil captured under the UX1 High School Microscope with the DCM5 camera at 400x.